1. Looking for an ISTE Standards Senior Project Manager! 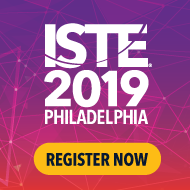 This is an exciting time at ISTE as the new standards are being adopted and implemented in school, districts and states. Feel free to share across your networks.